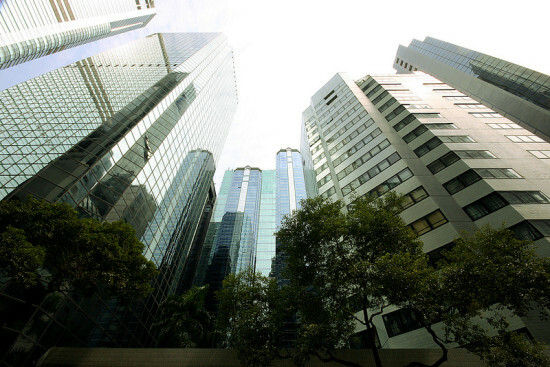 In architecturally crowded Hong Kong, plazas are a rare breath of open air. The luxurious Causeway Bay district, whose retail rental rates surpassed New York City’s Fifth Avenue in 2012, is home to one of these sparse open spaces, Sunning Plaza. I.M. Pei’s 27-story edifice faces a large public courtyard, a hardscape relief within the densely built area devoted to commercial shops and restaurants. But, such a luxury is always in threat of expansion. 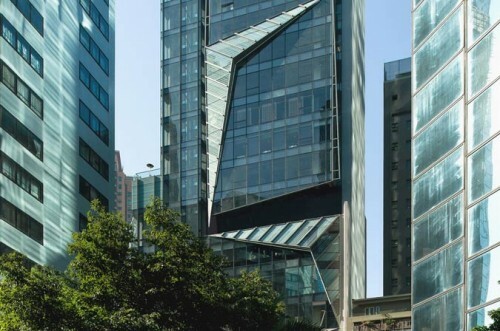 Artinfo reported that developer Hysan will soon be converting the space into additional commercial stores and offices. Pei’s 1982 building is to be demolished by the end of this year and the plaza is going with it. 31 years ago, Sunning Plaza was Pei’s first structure built in Hong Kong. The mirrored glass office tower is still only one of his two architectural projects in the city. Although visitors often make use of the building’s public court, Causeway Bay is a high traffic shopping and business district. Hysan plans the new structure as a larger, mixed-use complex. Sunning Plaza will be demolished before the end of 2013. The entire redevelopment project is expected to be complete by 2018. Mobile M+: INFLATION! Tues – Thurs: 12pm to 7pm Fri – Sun: 11am to 8pm During Art Basel Hong Kong: May 23 to 26, 10am to 8pm Venue: West Kowloon Cultural District Promenade The basic bouncy-house concept has officially been brought to an entirely new level. Turner Prize-winning British artist Jeremy Deller created Sacrilege, an interactive work on which visitors may bounce to their hearts’ content. 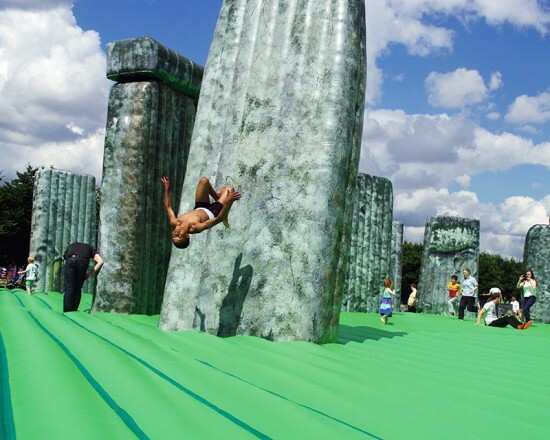 As a co-commission between the Glasgow International Festival of Visual Art and the Mayor of London, the work is a full-size inflatable replica of the world-famous monument Stonehenge. Sacrilege initially appeared in Glasgow to tour as part of the London 2012 Festival and was unveiled last week at Hong Kong's Mobile M+: Inflation!. Sacrilege is set on the West Kowloon promenade, the prospective site of the West Kowloon Cultural District, alongside five additional massive inflatable sculptures designed by other local and international artists. The installation is built of a 35-meter wide artificial green grass base and inflatable moss-covered slabs measuring seven meters high. The structure establishes a stark contrast to Hong Kong’s profoundly urbanized setting and creates a fantasy landscape inside the metropolis. Deller set out to offer audiences an opportunity to reacquaint themselves with history utilizing a high-spirited approach. 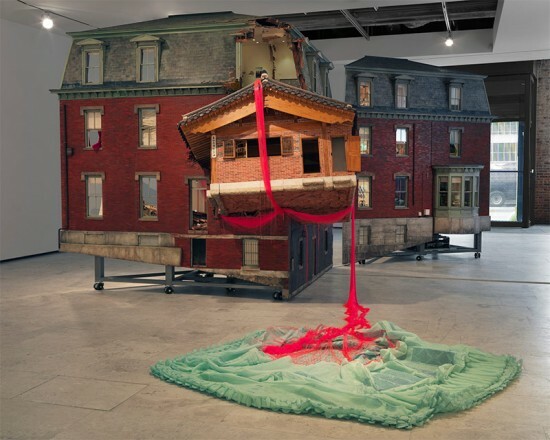 The M+ exhibition, one of the leading contemporary art exhibitions set in the city, emphasizes potential possibilities for multi-disciplinary art programs on the site in preparation of the park’s 2014 opening. 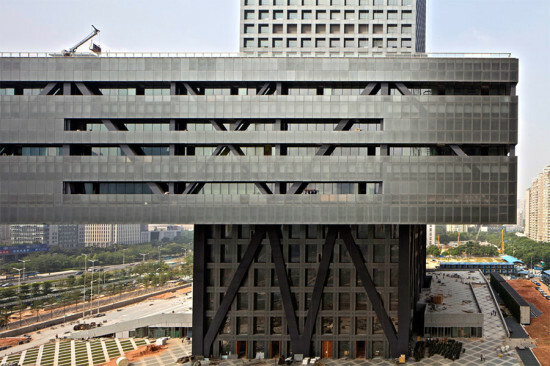 Rem Koolhaas and OMA may have grander commissions and more famous clients (Miuccia Prada? ), but probably not a more devoted and long lasting partnership than with David Maupin of the Lehmann Maupin Gallery. The gallerist first commissioned Koolhaas to design a new exhibition space on Manhattan's Greene Street in 1995 and again when they moved to 26th Street in Chelsea ten years later (there is non-OMA-designed Lehmann Maupin on the Lower East Side). Now the Lehmann Maupin Gallery has asked OMA to design a third gallery, this time in Hong Kong. On Greene Street Koolhaas gave Lehmann Maupin a simple but stunning design that featured an enormous moving plywood wall that was at once not precious (like Soho at the time) and a classic white box gallery. The Dutch architect carried this same theme over to Lehmann Maupin's Chelsea gallery but with the addition of travertine floors. Now for Lehmann Maupin's latest gallery, in the central, pre-war Pedder Building in Hong Kong, Koolhaas has brought a bit of old Soho "loft" style to Hong Kong. The new gallery space features marine plywood, modern fixtures and minimalist lighting set against the rough existing walls of the Pedder building. The new design features a corner entrance "that obscures the boundary between the interior and exterior" while leaving the two gallery rooms divided by a large sliding plywood wall/partition as in Soho. It's a honest, straight-forward design that "reveals, rather than conceals, the patina that distinguishes the historic building from its more glossy neighbors." The art work in this Hong Kong Image is from the gallery's first show of the Korean artist Lee Bul. Nicola Formichetti, best known as fashion and creative director and collaborator for brands including Mugler, Uniqlo, and Lady Gaga, has teamed up with Gage/Clemenceau for the second in a series of concept stores. The collaboration was brought about by BOFFO Building Fashion 2012, a program that paired fashion designers with architects in a series of pop-up spaces. The first installation, in New York, featured a mirror-paneled ceiling and walls in kaleidoscopic crystalline formations, an ambitious and visually arresting space to showcase Formichetti’s work. The new collaboration in Hong Kong houses a collection of original garments from the personal collection of Lady Gaga as well as Formichetti’s own line and products from his new “Nicopanda” brand. Like its New York sibling, the walls and ceiling of the Hong Kong store are entirely clad in mirrors. Walls are paneled with 350 one-meter-high clear plastic tiles that were vacuum-formed using a panda figurine mold designed in collaboration with Stage Technologies (whose portfolio includes work with Cirque du Soleil and Batman Returns). The panels are then illuminated by automated color-shifting LED lights and are for sale to the public, with the intention that they scatter from their original setting to find their way into the homes of patrons. We're fairly critical of the planning process here in New York, but our pal Norman Oder has us beat a thousand times over with his watchdog website The Atlantic Yards Report. Which is why we were surprised to find him writing over on Urban Omnibus about just how laudable our way of doing things can actually be, at least compared to the current vogue for Asian-style authoritarian planning, particularly that of Hong Kong. Jumping off from Vishaan Chakrabarti's praise for Hong Kong's "doubling down on density," Oder points out that of the locals he's heard from, "enough is enough." [T]hose from Hong Kong invoked our city’s appreciation of history (or, to them, heritage), diversity of building types, avoidance of superblocks, rich street life, and relatively robust opportunity for citizen input. 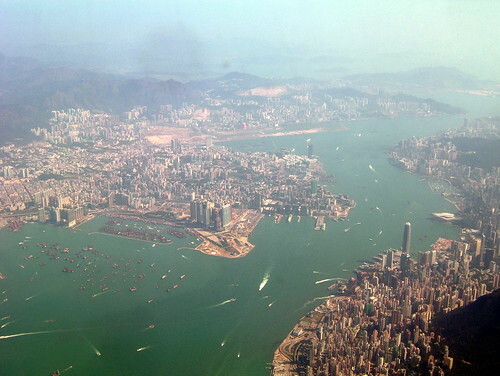 As became clear, density in Hong Kong was fostered by cultural, economic, and historical factors not present in recent-day New York, including top-down planning, warp-speed growth (driven by an influx of refugees from Communist China), an empowered mass transit agency, and a disengaged citizenry. So while there’s a good argument to build residential density in New York — our city’s towers are primarily commercial — as well as infrastructure, the lessons from Hong Kong may be more aspirational than direct. Could you imagine the MTA being the lead planner? High-rise-induced (as opposed to merely abetted) suicides? Luxurious apartments sprawling some 750 square feet? Because these are some of the astounding realities of Hong Kong as recounted by Oder, and even to a degree by Chakrabarti. Whether this is better or worse than New York, we'll let you decide. We've got fare hikes, gentrification, outrageous prices. (Okay, Hong Kong's got us beat there.) But we've also got brownstones and a semblance of public input. Small victories, but victories all the same. And you thought your apartment was small. Gary Chang, a Hong Kong architect, has outdone us all, managing to cram 24 "rooms" into his 344-square-foot box apartment through the clever use of movable walls, murphy beds, and other various architectural tricks. As he explains in the Reuters video above, it's the perfect bachelor pad. "I realized that at one moment, I'm performing only one task, so the ideal thing for me is, I don't have to move, I'm quite lazy, but the place changes for me," Chang explains. It's a far cry from his upbringing in the space, however, when he shared it with his parents, three sisters, and a tenant. Should he ever get a girlfriend, he'll surely find a way to manage.